After a while one gets bored with the masses of mid-summer yellow prairie flowers, which makes the purple species that are coming along now especially welcome. 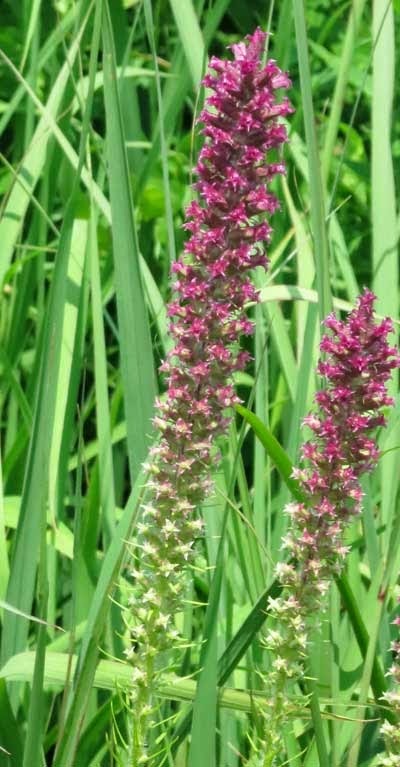 One of the great species is prairie blazing star (sometimes called gay feather) (Liatris pycnostachya). I have seen whole fields of it, but I find it more attractive as a focal point in a prairie. It has a fairly wide range, from mesic through wet-mesic to wet. Although it forms corms which can be dug and divided for replanting, it is fairly easy to get started from seed. In a new prairie planted from a seed mix, it usually takes about 3 years to start showing. One of the interesting characteristics of species of the genus Liatris is that they bloom from the top down, in contrast to most flowering plants. The photo here shows two stalks in the early stages of flowering. According to Cochrane, since bee pollinators visit the bottom flowers of a stalk first, this method of flowering ensures that the young flowers are visited first. 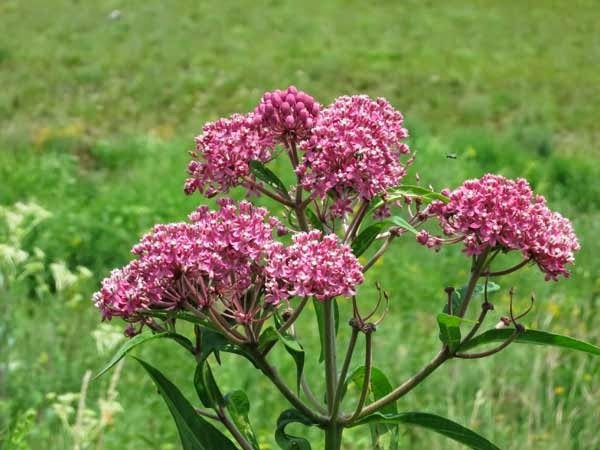 The other reddish or purple-flowered species that is now in full bloom is the swamp milkweed (Asclepias incarnata). This is only found in wet places, and occurs at Pleasant Valley Conservancy only in our wetland where standing water is present or nearby. The best place to see this species is along the lane that separates the Crane Prairie from the wetland. Individual plants tend to be widely scattered. Swamp milkweed (Asclepias incarnata) growing at the wet edge of the Crane Prairie. 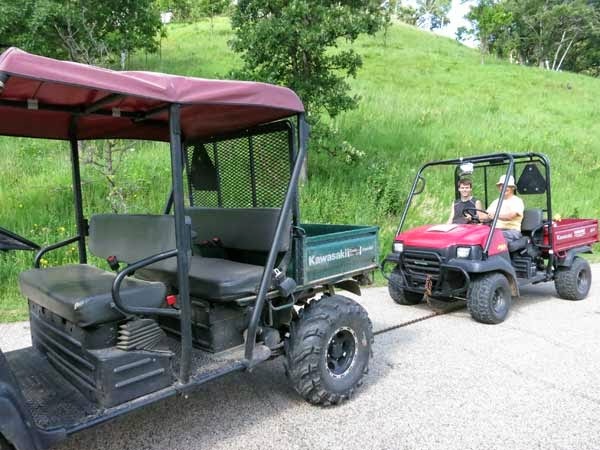 We have two Kawasaki Mule utility vehicles and they are indispensable for our restoration work. Thursday the red Mule broke down for Kathie when she was at the far end of the service road, about a mile from Conservancy entrance. Fortunately, she was able to reach Ben on the cell phone. We have a heavy duty chain that we use to pull cars out of ditches or when stuck (you'd be surprised how often that happens! ), so we threw it in the back of the green Mule and drove to the scene of the breakdown. I drove the green vehicle and Kathie guided the red one. The main problem with pulling a vehicle is to keep tension on the chain, so there are no stop and start jerks. The vehicle being towed has the responsibility to keep tension by judicious use of the foot brake. We had no trouble along the top straightaway but going down the steep hill at the end was another problem. Our road down the hill has two steep downward parts with a level area in between. (The level area is due to a 20-foot erosion-resistant phase of Black Earth Dolomite inserted between two sandstone layers.) At the top of the first down we disconnected the tow vehicle and let Kathie coast down to the middle level area. Then we hooked up again and I towed her all the way to the bottom. This last was tricky, as the bottom hill is quite steep, and if you lose control you would fly all the way to the town road below, unless you ran into a large hickory first. Most of Kathie's control was with the foot brake, but she also had her hand on the emergency brake in case the foot brake failed. We know what could happen if a vehicle went out of control on this lower steep road, as due to a stupid error on my part, the green mule once got loose and went all the way to Pleasant Valley Road, rolling over on the final road cut. (I jumped out just in time.) The repair bill was >$2000! The photo here shows the final stage of towing. We could have used our GMC Sierra truck to bring the red Mule out, but it would have been harder to coordinate the job. The two Mules worked beautifully together. We checked the spark plug and a few other possibilities, then called our service people (Richie's in Barneveld) to come and pick the Mule up. Hopefully we will have it back in a few days. We bought the red Mule about 10 years ago and it has been indispensable for our restoration work. We have a 65 gallon pumper unit that fits in the back (for burns) and a 25 gallon Fimco herbicide sprayer (for spraying projects too large for the Solo backpack sprayer). The green Mule we later bought second hand and use it when we have more people working, or to take visitors on tours. With the large knobby tires, it works beautifully in snow and we used it all last winter for wetland restoration work. It easily plowed through 6-8 inches of snow along the lane that separates the Crane Prairie from the marsh. 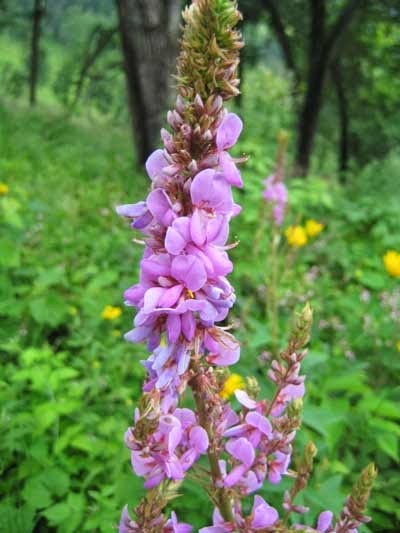 The topic today is showy tick trefoil, Desmodium canadense, a handsome species of prairies and open savannas. Since we have dealt with several native prairie/savanna species that are rhizomatous and invasive, we now become worried whenever we see large patches of any species, even one considered desirable. Although according to the literature this species is not rhizomatous (it apparently has a large tap root), in our hands it sometimes forms large patches. Apparently, these patches are formed as a result of the prolific formation of seeds that cling firmly to clothing, fur, or skin. According to Dave's Garden: "Self-sows freely; deadhead if you do not want volunteer seedlings next season." We first planted this species in Toby's Prairie in 1998 (16 years ago), and it has been planted in all the new prairies we have planted since then. The seeds were local, collected from scattered plants along County F. It has also been planted in the savannas as these have been restored. As the years have gone by, it has sorted itself out, and is now found mainly in wetter areas. The large patch shown on the photo below is present in an area of the Pocket Prairie which receives drainage from the ravine. We also have a large patch in the (wetter) former aspen zone at the south side of Toby's Prairie. At one time we collected seeds from our planting to distribute at other areas of the Conservancy, but we no longer do this, as it seems to get around quite well on its own. The farm house near our cabin was burned down by a former landowner. The land under and around the house was ignored until we removed the debris about 15 years ago. By the time we started restoration work here, the land had become a major weed patch. Wherever there weren’t conventional weeds, day lilies had run amok. Once we started, it took us 12 years to eradicate all the bad plants and to get a lush, diverse prairie established. Although not a Superfund site, the legacy of the house structure undoubtedly made this restoration difficult. Our experiences might be useful for those trying to establish natural areas in urban areas. Before planting, the herbaceous vegetation and the brush were treated with 2-3% glyphosate (foliar back-pack sprayers) and the dead vegetation burned off. In November 2002 the site was planted with a prairie mix suitable for dry-mesic to mesic conditions. Although prairie plants became established, there still remained a lot of undesirable vegetation. The principal undesirables were day lilies, brambles (mainly black raspberries) and sumac, with occasional honeysuckle. We got started with serious eradication work in 2006 and finally, in 2014, we seem to be finished. Although this seems a long time, I suspect it is typical of what one can expect when restoring such a very bad site. Since it was a small site (less than 1 acre), complete canvassing the site could be done, ensuring that no invasive plant was missed. We burn this site every year, usually in mid- to late-March. As soon as the invaders started to appear they were sprayed, several times during the early growing season. The goal was to have all the invaders sprayed before prairie vegetation got too big. Further details are given below. Day lilies. There were lots of these, and they had spread all through the site, as well as into other areas nearby. Because this is a monocot, glyphosate was used. Fortunately, these plants show early so we could kill them before “good” species got too big. However, day lilies have a deep, persistent rhizome system, making them difficult to kill. We discovered that for success we needed to use a high concentration of glyphosate (8%). Brambles. These generally don’t begin to appear until early May, but continue to show throughout most of the month. We attempted to catch these at the rosette stage, using a foliar spray of 3-4% Garlon 3A. Any plants that were missed in the May sprayings were allowed to grow until they were several feet tall (so we could sure we weren’t missing any), and then killed by basal bark treatment with 20% Garlon 4 in oil. Complete eradication took so long presumably because of the extensive rhizome system. Sumac. This shrub also has an extensive rhizome system, but has the additional problem that it root suckers extensively. Thus, after the above-ground plants are killed with Garlon, root suckers form and will continue to appear until late summer. Those shoots appearing in early June can be sprayed with Garlon but those missed or arising later are best allowed to wait until they are large enough so that they can be treated by Garlon 4 basal bark. Like brambles, eradication of sumac took quite a few years. Even though the prairie plants had become well established over the first 3-5 years after seeding, it took at least 10 years to eradicate day lilies, brambles, and sumac. Ragweed and other annuals were hand pulled before flowering, generally by mid-summer. Because this site was small and was near the cabin, it could be monitored easily, which was a real advantage. The photo shows what the site looks like now. Part of the Cabin Prairie that was planted on the old house site. I stumbled across a link to this video while editing the Oak Savanna page on Wikipedia. Well worth watching this 8 minute video. Although the species are different in Oregon than in the Midwest, the habitat seems very similar. The principal oak here is the Oregon white oak or Garry Oak, Quercus garryana, named for Nicholas Garry, a deputy governor of the Hudson's Bay Company in the early 1800s. This species ranges from southern California to southwestern British Columbia, growing mostly at lower altitudes. 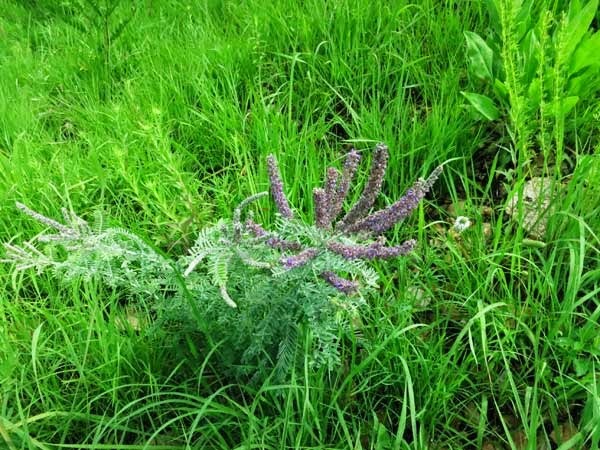 Those battling weeds in natural areas can't help being depressed as they drive along and see large populations of enemy plants. Late summer is especially bad as these weeds start setting seed. 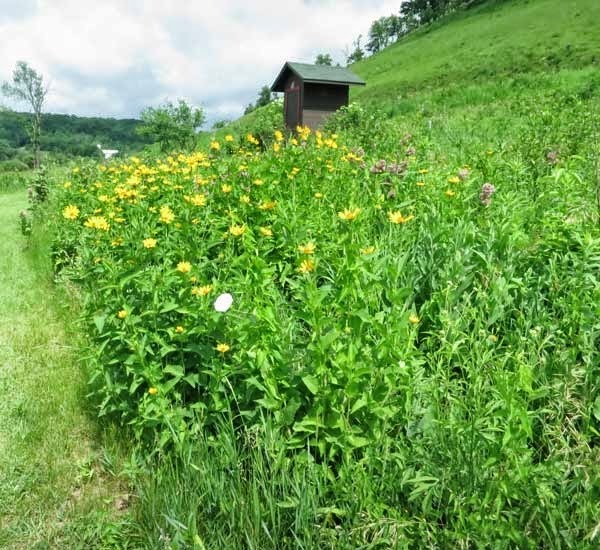 Some of these weeds are biennials, and can be controlled if they are mowed at the right time. Over the last few years the mowing crews seem to have realized this and now are trying to work at the right time. Unfortunately, with the large mowers they use they can't get next to sign posts, guard rails, and other permanent structures at the edge of the highways. 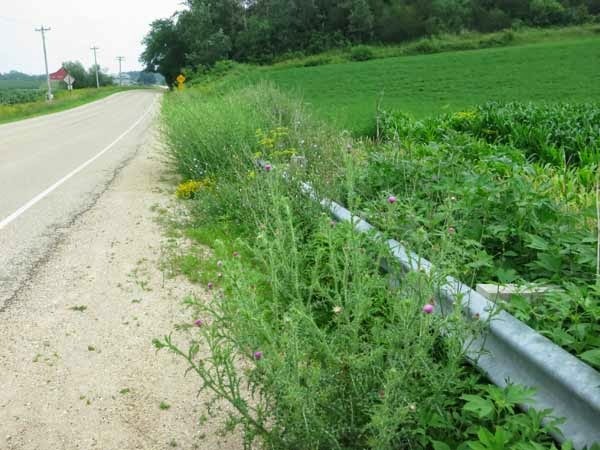 Kathie and I did a brief survey of the unmowed weeds present along this particular Dane County Highway KP guard rail. The diversity was not surprising. What was disturbing was the number of perennial species, since these cannot be controlled by mowing. They must be sprayed with a broad-leaf-active herbicide. Some of the shorter weeds, such as bird's foot trefoil, "like" to be mowed. That is, because of their short stature the mower misses them, and since competition from the taller-growing weeds no longer occurs, they flourish. This is why bird's foot trefoil is so common on mowed median strips in urban areas. Despite the diligence of road crews, I am not encouraged that significant control of our roadside weeds can be developed. There are too many ecological and political problems. Black Earth Rettenmund Prairie State Natural Area is always one of the great sites for the showy butterfly milkweed (Asclepias tuberosa), but this year is especially nice. I counted 180 plants, mostly fairly large, in a small (1 acre) patch which is representative of most of the 16-acre prairie remnant. The photo here, of the South Unit, is typical. The area we call the "Saddle" is also especially nice, but the whole prairie is in full bloom. This species does especially well in dry mesic prairies such as Rettenmund, where it is found in association with lead plant, Coreopsis palmata, prairie rose, compass plant, rosin weed, big bluestem, needle grass, prairie dropseed, and rough blazing star. Those following these posts may remember that butterfly milkweed was also doing well at this site in 2012. However, soon after that post was made, the effects of that summer's drought made themselves felt, and many of the plants started to senesce. Seed set that year was very poor. Although the species snapped back in 2013 it was nothing like this year. The following observation indicates that butterfly milkweed self-seeds well. 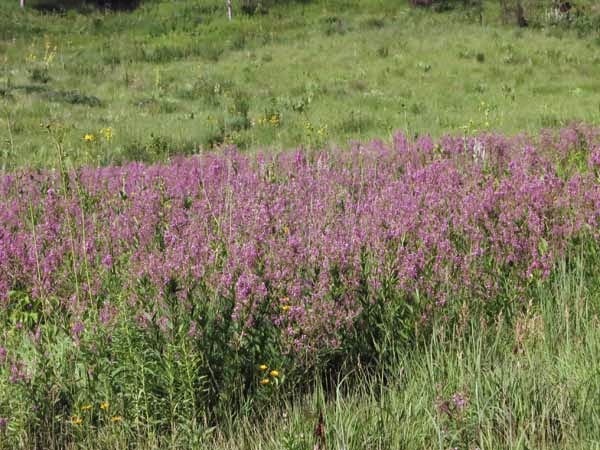 Adjacent to Rettenmund Prairie is a 3 acre pasture that has not been grazed in about 20 years. When grazing was discontinued there were no prairie plants at all. We have been burning this pasture biennially since 2002. Nothing has been done to this pasture except burning, yet as the years have gone by it has turned into a prairie remnant dominated by little bluestem, with a few scattered forbs. 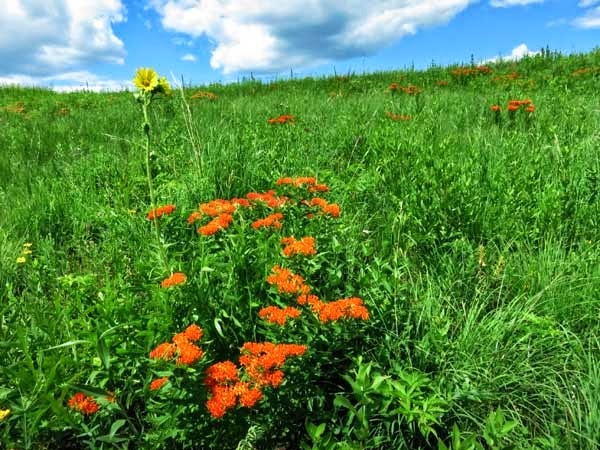 About four years ago, butterfly milkweed plants started to appear, and the number has gradually increased. This year the number of milkweed plants is quite large, as the photo below shows. Former pasture now rich in milkweeds. Subjected only to biennial burns. This is a dramatic example of the ecological power of fire! An interesting fact about butterfly milkweed is that in contrast to all the other milkweeds it does not have a milky sap. Although it may take a while, it is possible to replace smooth brome with a high diversity of native prairie species. 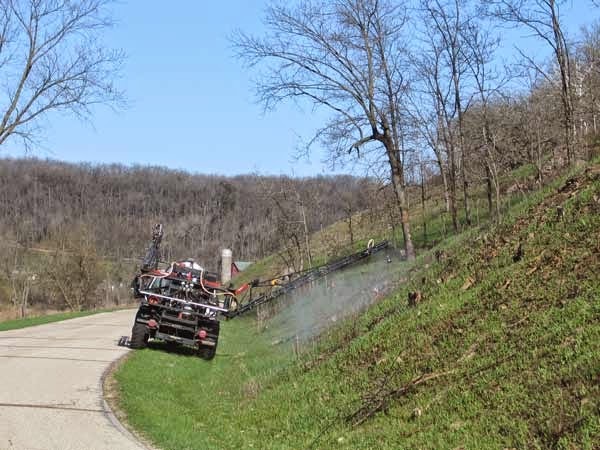 In the early days of our restoration work on the road-cut of our south-facing slope, while we were concentrating on brush/tree removal and wild parsnip/sweet clover control, smooth brome got started. Due to ignorance, we ignored it! Within a few years it had become well established, and native species had become scarce. In contrast to the south slope as a whole, which was (and is) a fairly good prairie remnant, the road cut was virtually barren with only a few "good" species. I assume this is a legacy of road construction, since Pleasant Valley Road was re-aligned sometime after World War II. Also, the road cut is steeper than the rest of the hillside, and hence more xeric. In 2005, five years after we had cleared the road cut and the whole south slope, we carried out an eradication of smooth brome on the road cut by early-season glyphosate spraying. This technique is described in some of my earlier posts. The photo here shows the spraying we did on April 14, 2005. Pleasant Valley Road being sprayed with glyphosate by the local Co-op in 2005. The green is virtually "pure" smooth brome. About a week after the road cut was sprayed, it was hand-planted with a complete prairie mix. Some of the species appeared within a year or two, but many of them took some years to get established. Although a few plants of lead plant were found after 6-7 years, this year, 9 years later, we now have dozens of plants. Since lead plant is a fairly conservative prairie species (C value of 7), and a virtual indicator of dry prairies, it is satisfying to see so many now well established. Lead plant (Amorpha canescens) now well established on the Pleasant Valley Road cut. Yesterday my brief survey came up with the following species now established on this road cut. Since this wasn't an exhaustive survey, I'm sure there are more. During the years since 2005, the road cut has only been managed by annual dormant season burns and brush control at about 3-4 year intervals. This year brush on the whole south slope was controlled by basal bark treatment with our standard method, 20% Garlon 4 in bark oil. Due to the steepness of the road cut, work there requires a bit of special skill. Thanks to Susan, Amanda, two Chris', Kathie, Heisley, Marci, Dan, Sara, Willis, and perhaps others for managing to stay upright while planting and doing careful brush control work!